In the 35th issue of the Bed and Breakfast Traveller, we take you to Ontario's South Coast, a popular destination because of its rich rural heritage, beautiful scenery, and year-round activities. 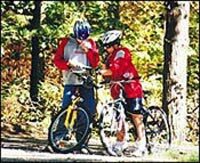 Ontario's South Coast on the North Shore of Lake Erie in the counties of Haldimand and Norfolk invites everyone to enjoy the many wonderful events, festivals and activities we have to offer. 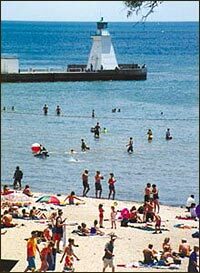 Situated in a rich rural area of Southern Ontario, you will find charming little ports along the lake, sandy beaches, small towns, quaint villages and vast lands producing a bounty of diverse agricultural crops. Carolinian forests are unique to this part of Canada because of our moderate climate. Long Point is famous as a World Biosphere Reserve where visitors from around the world study birds and other ecological phenomena. 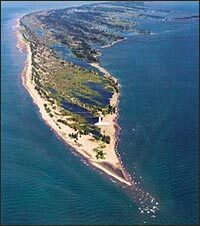 It is also home to the National Headquarters of Bird Studies Canada (www.bsc-eoc.org) and the Long Point Bird Observatory where you can observe bird banding first hand. The Grand River has been declared a Canadian Heritage River because of its significant history and incredible natural beauty. Witness thousands of migrating Monarch butterflies each fall at Rock Point. A multiplicity of festivals takes place every year attracting thousands of visitors (see below for festivals and dates). Relax on a lunch or dinner cruise along the Grand River (www.boatfarm.on.ca) or on the Lake (www.harbourprincesscruises.com). Ecological boat tours to the Lighthouse at the tip of Long Point are an educational adventure. Explore the Lynn River and Black Creek on the River Rider. Bring your canoe, kayak or boat and reel in some yellow perch, pickerel, pike, bass or walleye. Divers can explore the many sunken wrecks in the Lake. Rentals are available. Try your skill at our numerous 9, 18 or 27 hole golf courses challenging the skill of both pro and novice. The Lighthouse Festival Theatre (www.lighthousetheatre.com) in Port Dover draws happy audiences to its plays, musicals and presentations in ever larger numbers each year. Tours of art galleries, museums and historic homes such as Ruthven, Cottonwood Mansion and Backus Homestead provide a meaningful cultural experience and an insight into the history of the area. Come visit this beautiful part of Southern Ontario and stay in the unique accommodations provided by the members of Ontario's South Coast Bed & Breakfast Association (www.bbcanada.com/associations/southcoast).